The Hyperion F3 Flight Controller gives you all the features you want, whether you're into FPV racing, acrobatic flying or drone photography. The F3 Flight Controllers next-generation STM32 F3 processor with hardware floating point unit for efficient flight calculations and the ever faster ARM-Cortex M4 core capable of loops speeds 2x faster than other boards. The Hyperion F3 Flight Controller builds on tried and tested software, processor and sensor technology to make your aircraft fly like it's on rails. The F3 Flight Controller also runs the open-source Cleanflight flight control (FC) software which has an ever-growing community of friendly developers and users. Being open-source means that you too can contribute to the system. The No-Compromise I/O lets you use all the features all the time; e.g. Connect your OSD + SmartPort + SBus + GPS + LED Strip + Battery Monitoring + Sonar + 8 motors - all at the same time! Don’t let the size fool you, the tiny yet and lightweight Hyperion F3 Flight Controller has a standard 36x36mm form-factor with 30.5mm mounting holes and weighs just 6 grams. With the built-in high-capacity black box flight log recorder allows you optimize your tuning and see the results of your setup without guesswork. Also included with the F3 Flight Controller is the developer friendly debugging port (SWD) and boot mode selection, unbrickable bootloader. 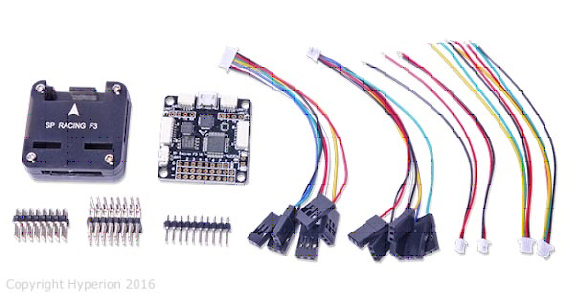 The F3 Flight Controller offers full support for OneShot ESCs for easy PID tuning and a sharper response. The F3 Flight Controller Supports SBus, SumH, SumD, Spektrum1024/2048, XBus, PPM, PWM receivers. No external inverters required (built-in). The Programmable LED light functions gives you dedicated output for programmable LEDs - great for orientation, racing and night flying. The F3 Flight Controller comes packed with other features such as battery monitoring ports for voltage and current, Sonar support for precision low-altitude hold, and a Buzzer port for audible warnings and notifications. The F3 Flight Controllers I2C port always powered, perfect for external sensors or always-on OLED Screen.